If you want to leave your jobs smelling beautiful and protects against germs, Whyte has the answer for you. We have specially formulised our own range of deodorising solutions. Our carpet deodorizer is not only a pleasantly perfumed air freshener available in multiple scents, but an odour neutralizer. It contains anti-bacterial, anti-fungal and anti-viral agents which are effective when the deodoriser is air-bound and on surfaces. 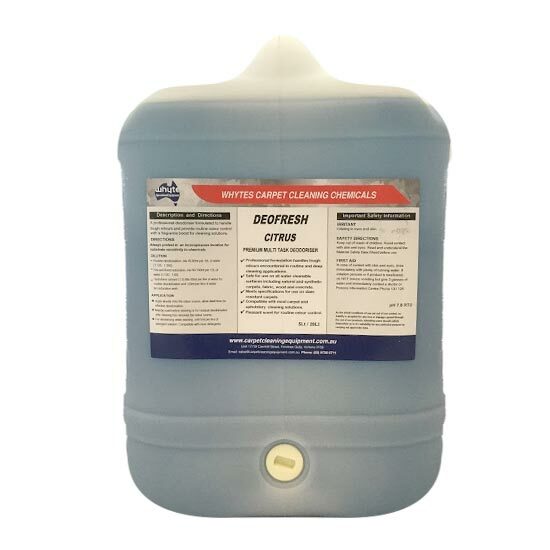 It’s sophisticated biocidal chemistry makes it the best carpet deodorizer on the market at destroying odour causing germs, and removing harmful bacteria from the air and surfaces. Properly cleaned carpets and upholstery help ensure a healthy environment by reducing the dust, allergens, and bacteria that may be present in the fibres of the fabric. Give your clients a safer home or workplace with our carpet cleaner deodoriser. Suitable for anything, from mild to severe odours, and perfect for porous surfaces like carpets and upholstery, Whyte’s deodoriser will freshen and sanitise any room. Keep homes and offices smelling fresh and inviting all day! Based in Ferntree Gully, our carpet deodorisers to businesses across Melbourne, Canberra, Sydney, Brisbane, Darwin, Perth, Adelaide and Hobart – and across regional Australia.